Find and make use of your public reviews! ... and show all available customer experience on your website or your online shop! and increase the traffic and conversion for your business! Over 60% of customers prefer to buy in shops with reviews or positive reputation! 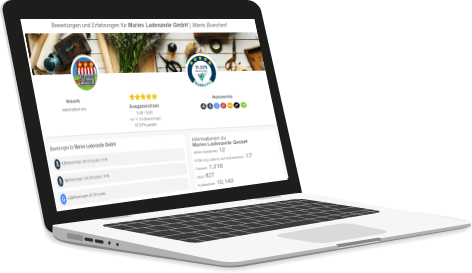 We gather all reviews about your business from different sources, like review platforms or sales channels, and bundle these experiences and reviews in one trust badge. Gain up to 5% more clicks by showing google stars. We provide Google with all reviews of your business and enable the presentation of google stars directly in the organic search results.
" We were convinced by the easy and sophisticated concept of Trustami. Such a service was missing in E-Commerce. We really like the flexible cooperation and the superb support. " Review aggregation: You can connect over 40 networks (e.g. eBay, Amazon, Etsy, Idealo) and import the reviews from there. For every network the reviews will be updated automatically every day or week, so you will see the actual reviews and overview everything at once. Trust Badge: Show your customers all reviews in one badge, which can be customized. Business Profile: You get a public Trustami profile on which customers can easily see how good your reputation is. This profile is optimized for search engines (SEO). Additionally you can place a direct link to your own shop or website in order to get more visitors. Google Stars: Show in the organic Google search your review stars to attract more visitors and gain more traffic. Rating Insurance: Protect yourself from loosing your reviews. Rating Alert: Get an E-Mail automatically if a customer gives you a negative review. Rating Dashboard: Get an overview about your reviews and gain insights about page impressions, review history and many more. Easy integration: Select from many plugins and apps for several shopsystems (Shopware, JTL, Magento, Prestashop) or include the Trustami widget with a few lines of code on your website. Trustami Award: The first independent award which shows customers how good you have performed compared directly to other businesses on sales channels or rating networks. Display at partners: Use Trustami on partner marketplaces or platforms (e.g. Hood.de). Only a few clicks are needed to get started. What can the Trustami review service? Trustami offers a service where all distributed ratings and reviews of an online seller are linked, updated and verified automatically. With the possibility to import ratings and reviews from all sources and the partnerships with large e-commerce platforms like hood.de Trustami sets new standards in convenience, ease of use and functionality. Online sellers boost their sales up to 35% by using the Trustami trust badge on platforms and their own websites. The heart of your company is it’s ratings and reviews! Have you already collected your ratings and reviews or are there any reviews about your company on several platforms on the Internet? Trustami enables you to combine all ratings and reviews in one place. This is quick and easy done with just a few clicks. Build trust through your ratings and reviews. Publish all of them on your profile and choose which information is publicly available. You can show or hide single networks in order to promote your latest ratings and reviews. Your Trustami Cockpit provides an overview over your online reputation. You can see the origin and date of any review. Trustami gives the right tools to walk through the review jungle. You will automatically be informed of new ratings and reviews every day, week or month. Trustami awards providers, that are the best compared to all other providers on one marketplace based on their ratings. These providers have a really good ratio between positive and negative ratings and gathered more ratings compared to the average provider. Show with Trustami all your reviews from many different platforms, in an easy way. Increase your traffic because customers find you better! Boost your conversion due to your good reputation!